While growing up in New Zealand, Eiko acquired his first SLR camera at the age of fourteen. He quickly discovered his passion for capturing images of animals, especially birds, in their natural habitat. During extensive trips along the West Coast of British Columbia and Alaska in the early 1990's, his focus shifted to coastal landscapes above and below the waterline. The catalyst that drew Eiko deeper into underwater photography were two shark diving expeditions in 2011. Whether exploring the ocean or alternate bodies of water, such as marshes and rivers, Eiko has developed a dramatic style in which he celebrates the corners of our world which are seldom seen. He captures the surreal through constant awareness of lighting and unique angles. He has won awards and has been published in numerous international magazines, including National Geographic, British Columbia Magazine, Diver, Sport Diver, Daily Mail, People! , Submerge, Ducks Unlimited, and Orion to name a few. His Fine Art Photography has also been sold around the world. 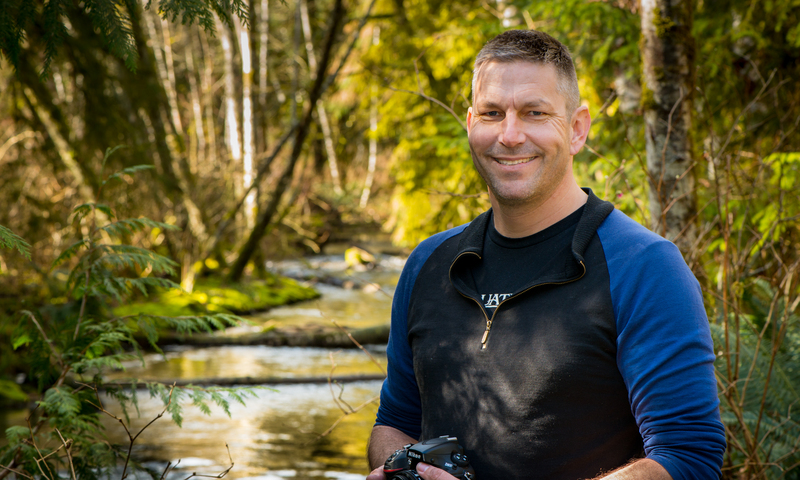 While a big part of his work focuses on Salmon and local watershed issues, other underwater and topside subjects round out his collection. Eiko is a proud member of the OCEAN ARTISTS SOCIETY. Eiko Jones on the banks of the Campbell River. At times I am overwhelmed by the beauty of the world around us. I am passionate about sharing this Pacific Northwest environment with everyone. Through artistic and dramatic imagery, I endeavor to offer people a glance of that world, whether they live in a big city condo, or have no ability to experience the world below or out in nature. My work is all about drawing attention to the entire environment and watersheds, from the mountaintops all the way down, and into our vast, but fragile oceans. Because of my work with wild salmon, I see firsthand the importance of a healthy, sustainable environment. Vibrant, wild salmon runs are one of the first things to diminish as encroachment and pollution affect a river. I believe the tide is turning for the benefit of our wilderness and our future generations. By people becoming aware of the need to protect our precious waterways, the salmon and associated wildlife are being helped. I look to the resilience of wild salmon as a great example of the forces of life itself. By making needed changes in our actions towards the environment, nature will achieve a balance and be restored to its once abundant state. Watch the above video for my thoughts on Salmon Photography and how I feel it helps with awareness and conservation. Follow Eiko Jones Photography on Facebook Google+ or Twitter @eikojnz to keep up with the latest happenings. Eiko also runs Salmon Safari / Canyon Diving. To see this spectacle firsthand consider joining one of our tours during the annual salmon runs. Click HERE for website. Thousands of Pink Salmon in the Campbell River Canyon.